DOMOTEX 2011 Only 3 Months Away! 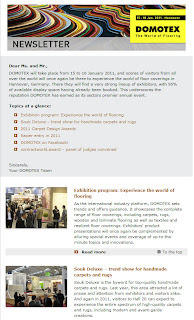 I can hardly believe that DOMOTEX 2011 is only about 3 months away! I'm happy to tell you that the Domotex team has been busy preparing for what is going to be another exciting global flooring event! Become a fan of DOMOTEX on Facebook for new and relevant information regarding the event. We are up to 89 Fans and growing! If you're not on Facebook, you can also follow us on Twitter or even join us on LinkedIn via the DOMOTEX Group. So you say you’re not a social media fan? We have you folks covered too! 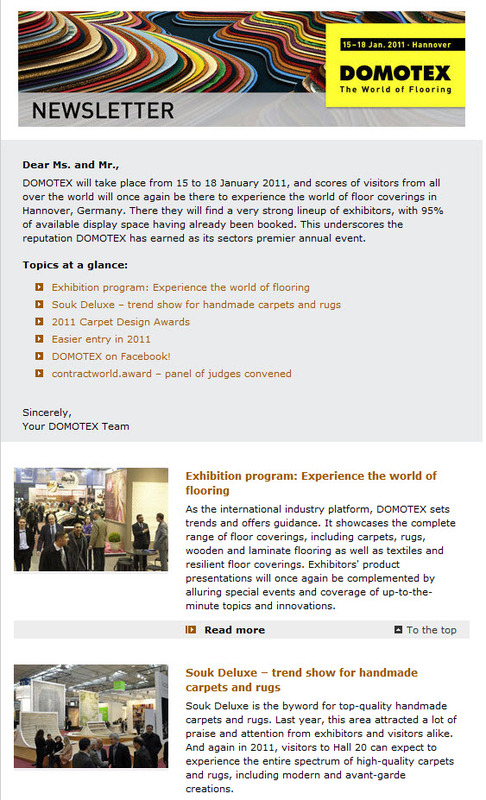 Sign up for the DOMOTEX Newsletter that will be delivered right to your inbox. Find out about all the special events that will be happening at next year’s Domotex. Time to Make Flight & Hotel Arrangements for DOMOTEX 2011! I also want to remind you to make your flight and hotel arrangements if you have not already done so for Germany. Hannover is a small city so hotel accommodations need to be done in advance. Hannover Marketing & Tourismus GmbH and Deutsche Messe have joined forces to help with hotel rooms as well as B&B accommodations in and around the city. You can find a listing of these properties by clicking on this link. Fax + 49 (0)511 12345-556.